Each week, Africa in Focus publishes a post to highlight a significant figure, chart, table, or graph that explores an important statistic or policy perspective to explain recent news and developments on the continent. This week, in our last Figure of the week of the year, we revisit our top 10 most popular posts of 2017. Notably, the most trafficked topics included China-Africa relations, urbanization, industrialization, and natural resources. In June, global management consulting firm McKinsey & Company published a report entitled, Dance of the Lions and Dragons, which analyzes the current and long-term trajectory of Chinese engagement in Africa. 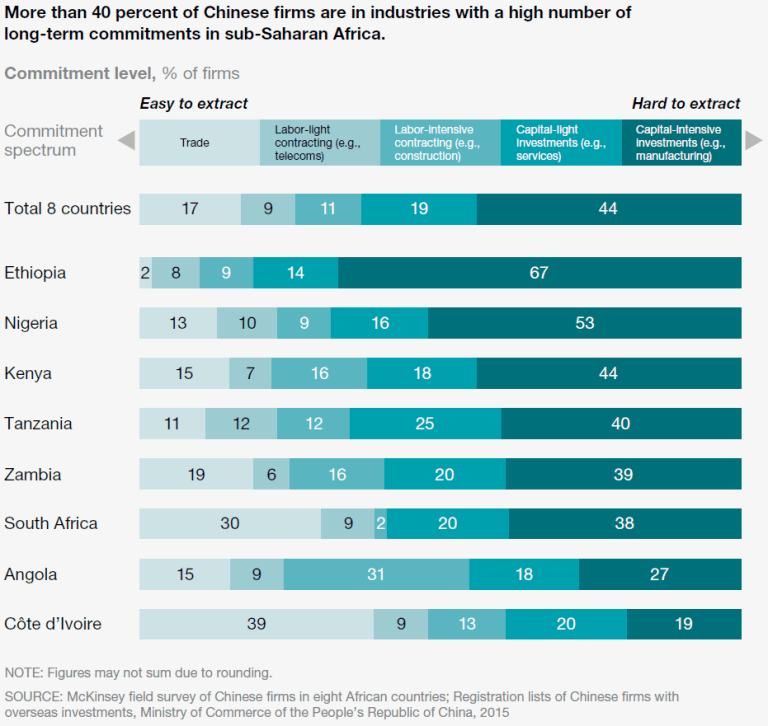 This figure shows that, while China has a relatively high confidence in Africa’s investment climate, as reflected by the prevalence of long-term investment commitments, there is room for improvement as many jobs offered to local residents are confined to non-managerial positions. Earlier this year, the OECD released the report, Social Protection in East Africa: Harnessing the Future, with a specific focus on Zambia, Kenya, Tanzania, Uganda, Ethiopia, and Mozambique. 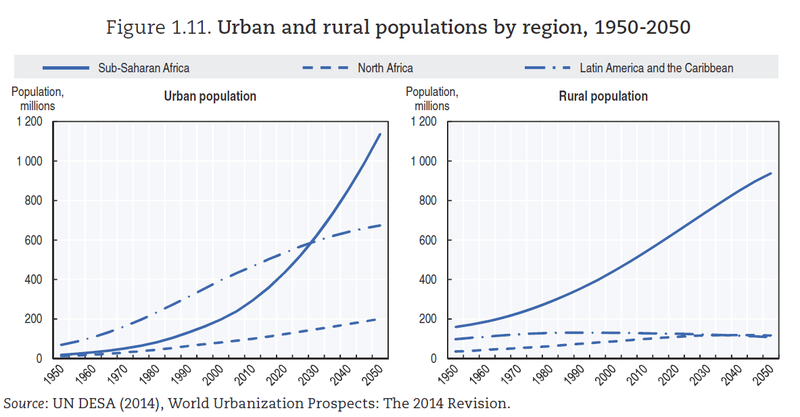 These figures suggest that these countries will experience rapid urbanization until 2050, which can be turned into reduced poverty levels under the condition that adequate social protection programs exist. 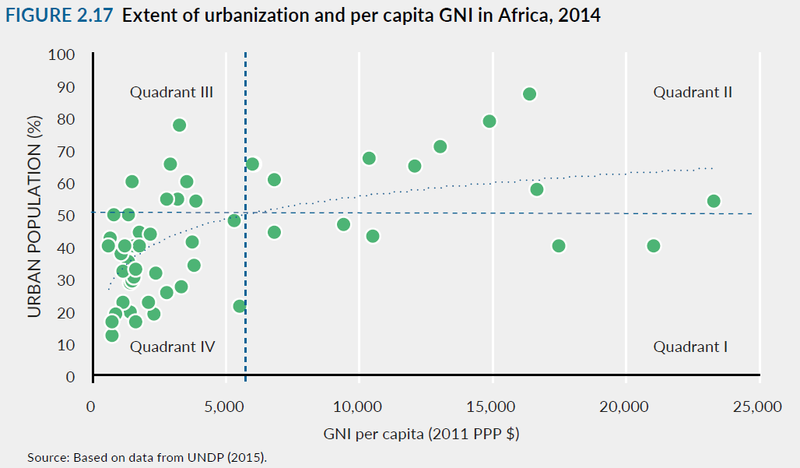 In September, the UNDP published the report, Income Inequality Trends in sub-Saharan Africa: Divergence, Determinants, and Consequences. 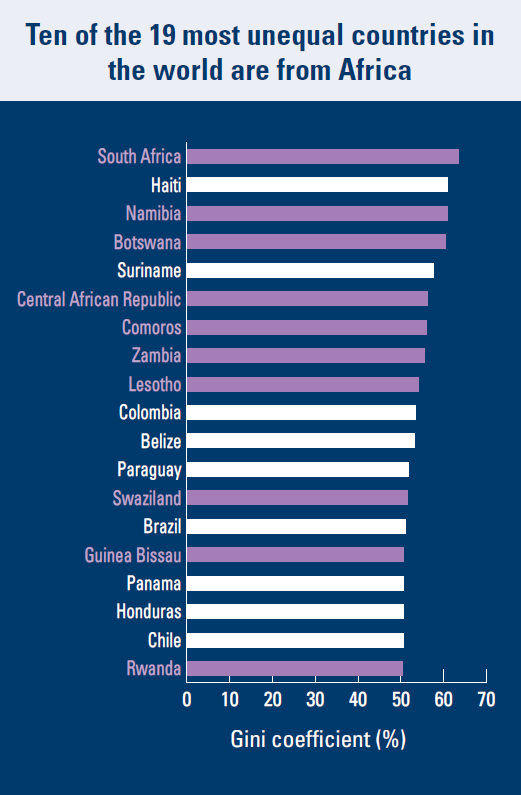 The report (and especially the figures we highlight) finds high heterogeneity in inequality among African countries. Factors behind the differences include natural resource dependence, high land concentration in settler economies of Southern and Eastern Africa, and the prevalence of informal sector employment. This year’s annual publication of the World Economic Forum’s Global Human Capital Report revealed that Ghana and Rwanda have largely optimized their long-term human capital potential, largely due to their efforts in closing the gender gaps in education and employment and large improvements in educational attainment among primary school students. China is presently transitioning from an investment-led to consumption-led growth model. 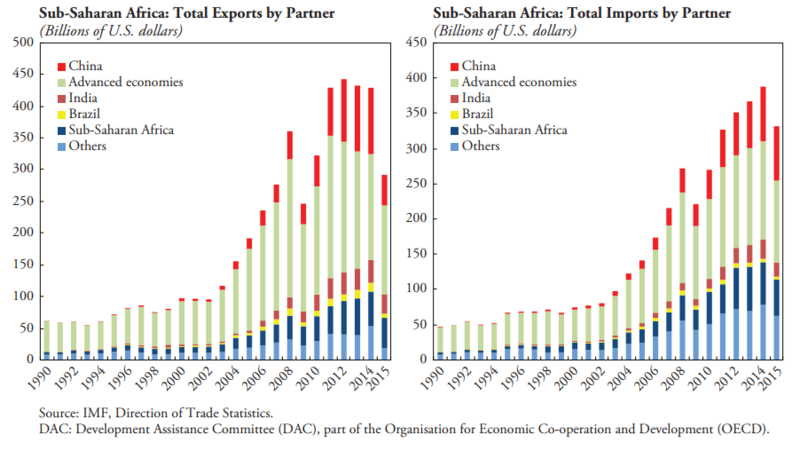 An April IMF report, A Rebalancing Act for China and Africa: The Effects of China’s Rebalancing on Sub-Saharan Africa’s Trade and Growth, finds that, having become Africa’s single-largest trading partners in the last 20 years, China’s restructuring will affect African economies through trading channels, as China is a large importer of African commodities. 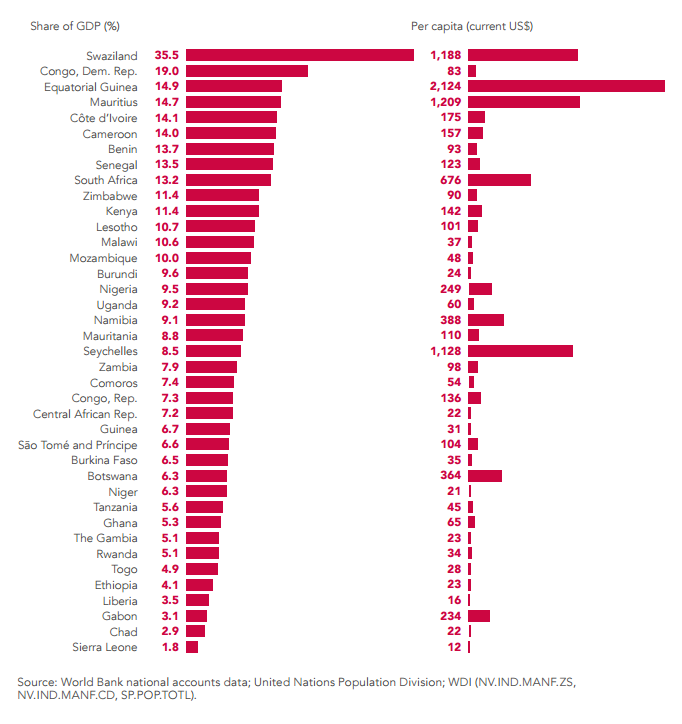 Nevertheless, as the figures suggest, African growth in past decades was largely driven by sound macroeconomic policies, strong institutions, and good governance. High commodity prices driven by Chinese demand actually had a less important role. The figures from the UNECA report, Urbanization and Industrialization for Africa’s Transformation, show the relationship between urbanization and industrialization and underscores Africa’s need to leverage the opportunities presented by urbanization to enable and drive industrial development. This will be realized by adopting the right policy frameworks anchored in national development planning and integrating industrial targets as a guiding force for urban planning and spatial policies. Principally used as a tool to disrupt communication means during important political events, government-induced internet outages have been on the rise on the continent. In addition to disrupting flows of information in countries, these outages also have an economic cost: An October 2016 Brookings paper estimated that in 2015 internet shutdowns cost countries nearly $2.4 billion in terms of reductions in economic activity facilitated by the internet. 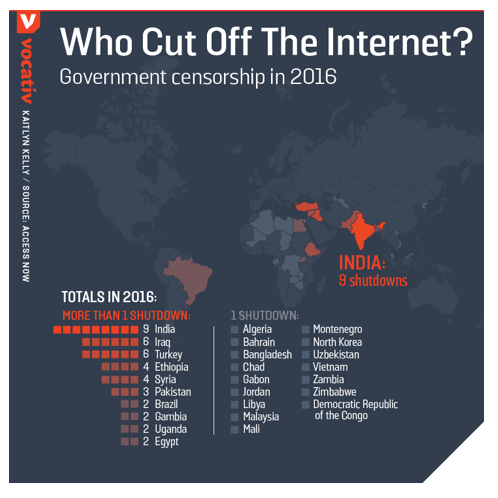 Internet advocacy group Access Now’s #KeepitOn campaign tracks government censorship around the world and finds that shutdowns occurred four times in Ethiopia, two times each in Gambia and Uganda, and one time in Chad, the Democratic Republic of the Congo, Gabon, Mali, Zambia, and Zimbabwe. 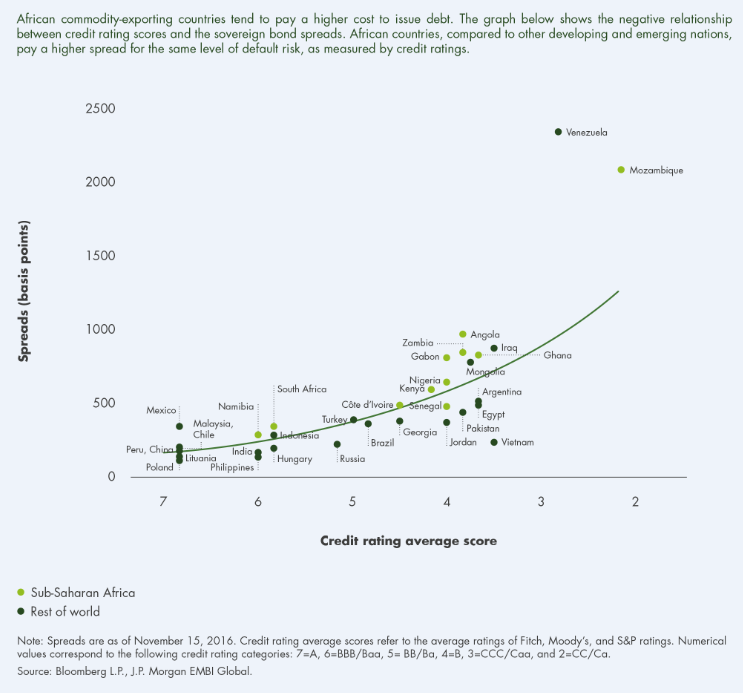 As highlighted in a figure from Foresight Africa 2017, African countries—notably oil exporters—face higher costs to service their debts than warranted by their credit ratings. 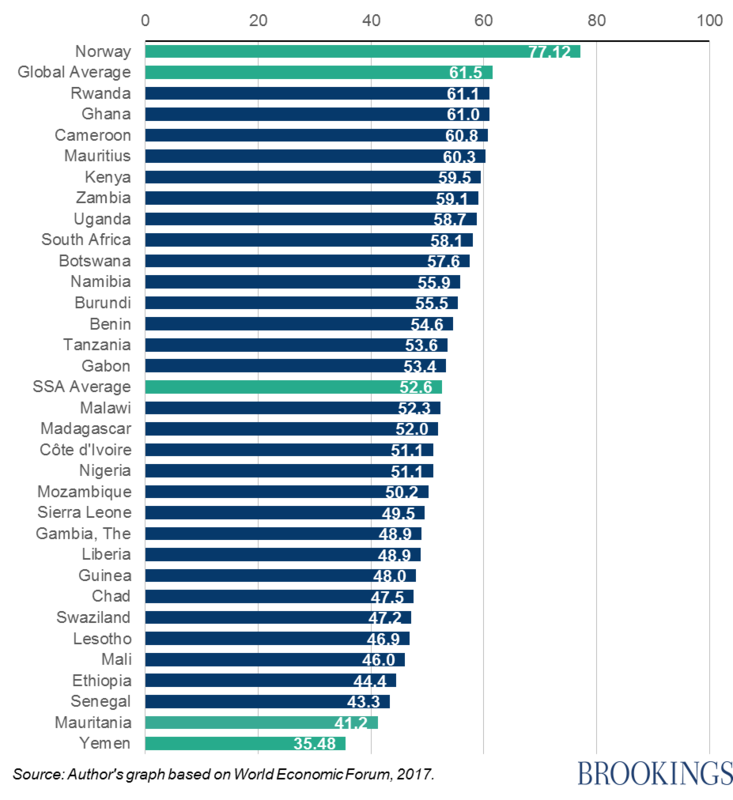 African countries pay a premium relative to countries in other regions. For example, Angola and Argentina have comparable credit rating scores, but Angola’s sovereign spreads are almost double that of Argentina (964 against 505 basis points). In June, the Africa Research Institute published the report, How Kenya is Failing to Create Decent Jobs, using taxation data to analyze individuals working in the formal economy in Kenya. 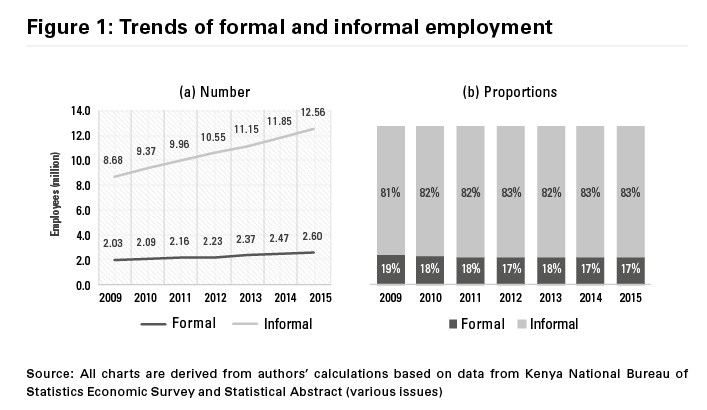 The report—as we underscore with the figures—found that jobs in the informal economy have grown much faster than the formal economy and that most of the wage-employed hold low-income jobs. The World Bank’s 2017 Atlas of Sustainable Development Goals (SDGs), an interactive data visualization demonstrating the progress of countries toward the SDG targets, found significant variation among sub-Saharan African countries in terms of manufacturing value added (MVA) per capita, which measures the relative value of net manufacturing output to the population size, and MVA’s share in GDP, which measures the role of manufacturing in the economy.